Quite a lot of Cutie Mark Crew news lately isn't it? 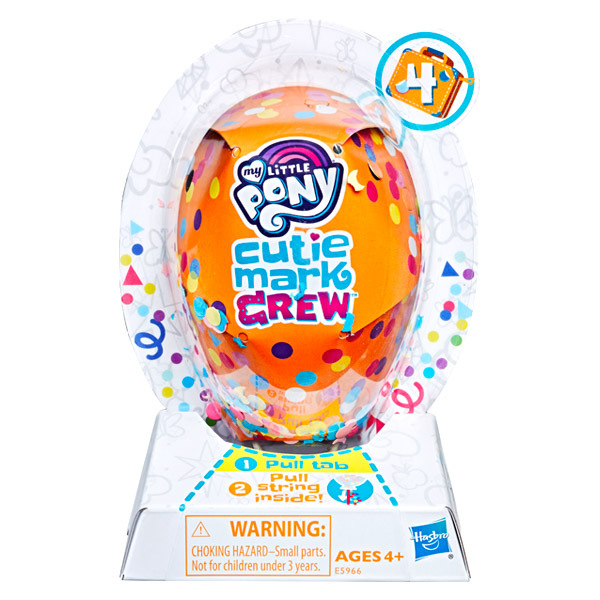 We received an interesting submission by one of our readers: Images for the 4th Series of the Cutie Mark Crew Blind Bags! This time they have appeared on a Hungarian website called: JátékNet. We already knew long ago that this series would be beach themed due a mix-up with an Amazon Listing not long ago. I'll post the info below as well to keep it all in one place. Just like Series 3 this one will have the confetti packaging as well which I kinda dislike. I think some yellow or blue "houses" would have worked lovely with a nice beach backdrop. We'll let you know once they've been spotted and are perhaps available on Amazon. We'll also list them in our database as soon as possible. Thanks a lot to Jenna for the heads up! The Cutie Mark Crew combines the worlds of My Little Pony and Equestria Girls to imagine a universe of play and friendships beyond the mirror's portal. 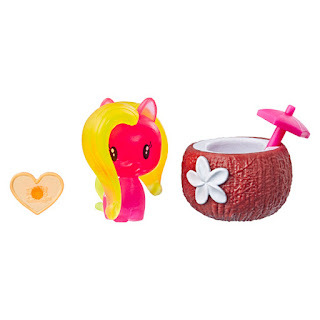 The My Little Pony Cutie Mark Crew Series 4 has an "Away We Go" theme, bringing together characters from the My Little Pony and Equestria Girls for a tropical vacation! Pretend some favorite My Little Pony characters are having fun in the sun with their beach-themed accessories. Each Beach Day blind bag includes an adorable 1.5-inch figure, beach-themed accessory, collector card, and a cute storage case. Collecting more Cutie Mark Crew blind bags means more stories to create. Which character is waiting inside? Find out! 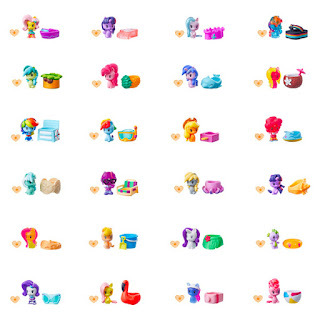 12 of the 24 available blind bag figures have fun treatments, like neon or glitter! Look for all 24 to stack more cases and build out a world of pony, seapony, and Equestria Girls Cutie Mark Crew figures (Each sold separately. Subject to availability). 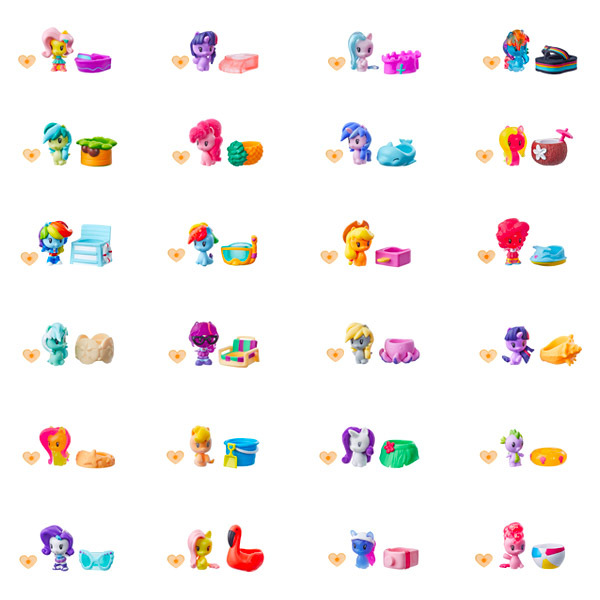 My Little Pony and all related characters are trademarks of Hasbro. Includes figure, figure stand, accessory, and collector card. Ages 4 and up. WARNING: Choking hazard - Small parts. Not for children under 3 years. NOTE: Purchasers will randomly receive 1 of 24 packs. I guess we'll find out when we get better quality images of each one. How exciting! I'm particularly excited about Lily Valley - such a cute accessory, and they didn't randomly make her a pegasus this time! Will they be available in the united states? Are ever getting to some news about the complete toyline of 2019? I'm happy for those who are enjoying collecting this line, but I wish they'd kept on making the regular blind bag figures. Would have loved to get Thorax and his brother and maybe one or two more changelings in one line. We can have Breezies, but we can't have these guys? 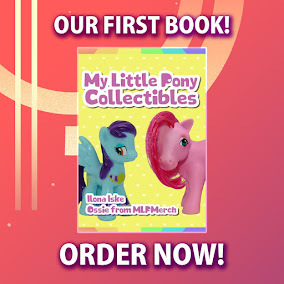 C'mon, Hasbro..